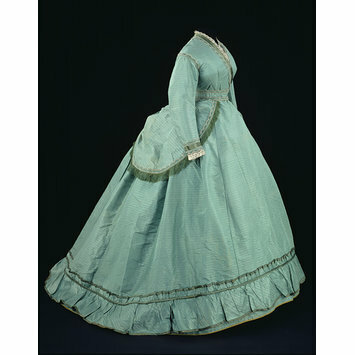 During the 1860s the fashionable skirt became flatter in front with the fullness receding towards the back. Women still wore hooped petticoats (crinolines) to give the desired silhouette, but they were no longer bell-shaped and by 1868 they curved out behind forming a kind of bustle. In order to fall gracefully over these new structures, skirts tended to be gored, that is construced with triangular panels rather than straight widths of fabric. The striped green skirt in this example is composed of eight gores that significantly reduce the amount of bulky pleating and gathering at the waist characterising earlier styles. Contrary to much speculation, these gores did not radially diminish the size of the skirt as The Englishwoman's Domestic Magazine pointed out in March 1868: 'Skirts are gored, it is true, but they are ample and flowing. Crinolines, far from being left off, have merely changed their shape; they are plain in front, but puffed out on either side so as to remind one strongly of the hoops or paniers of the last century'. This dress follows the vogue for historical revival with its separate draped overskirt loosely based on eighteenth century polonaise gowns. Some looped-up styles were given nostalgic names such as à la Watteau and ‘Marie Antoinette dress' or were raised with cords and ribbon bows in the style of the originals. The resulting puffs and draperies were copiously trimmed with silk fringe, brocaded satin braid, beads, marabou feathers, garlands and applied silk flowers. Beneath all these layers and decorative trimmings it is a wonder that a woman could discreetly find her watch pocket which was often concealed in the waistband of her skirt. Machine-stitched day dress consisting of a bodice, skirt, overskirt and waist sash made of silk woven with a horizontal stripe and trimmed with braid, beads, hand-made Maltese-style bobbin lace and silk fringe. Made from green silk with a woven horizontal stripe trimmed with a green and white scalloped edge, braid embroidered with clear crystal beads around the neck, shoulders, cuffs, waist belt and peplum. 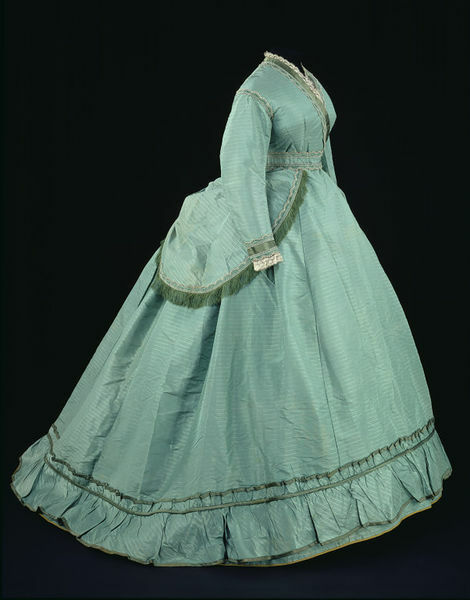 Faced with darker green satin and hand-made bobbin lace at the neck and cuffs.